High protein and high fiber savoury waffle (or pancake!) recipe- without the use of protein powder! 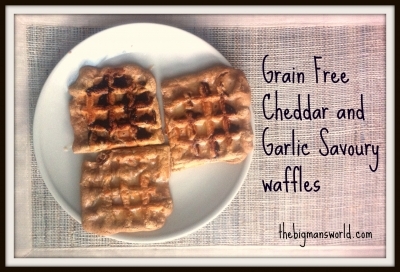 The combination of cheddar cheese and garlic in the waffle batter makes this a winning dish for breakfast, lunch or dinner! Don't have a waffle maker? They work great as pancakes! In a large mixing bowl, sift the coconut flour, peanut flour and baking powder. Add the onion powder and garlic powder and mix until combined. 2. In a small bowl, whisk together the eggs and egg whites until foamy. Add to the flour mixture and stir until fully incorporated. Batter should be like dough. 3. Add the shredded cheeses and garlic clove and mix into the dough. Using 1 tablespoon at a time, add your liquid of choice until a semi thick batter is formed. 4. Coat heated waffle maker generously with oil and cook the batter until it is all used up.